Labour epidural analgesia has been shown to be safe and beneficial in parturients with complex cardiac conditions, and reduces maternal and foetal morbidity and mortality. Reported incidence of hypertrophic obstructive cardiomyopathy (HOCM) in pregnancy is approximately 2 per 1000. Pregnancy associated with HOCM is a rare occurrence; it poses a significant morbidity and mortality risk to both mother and foetus. Here we discuss two cases of pregnancy with HOCM managed successfully using epidural labour analgesia. A 26-year-old primigravida at 35 weeks of gestation presented with history of palpitations since 28 weeks of gestation. There was no history of breathlessness, syncope, abdominal distention and leg swelling. Further workup and echocardiography revealed asymmetrical septal hypertrophy with thickness 3.25 cm. Systolic anterior motion (SAM) of mitral leaflet was present. Left ventricular outflow tract peak pressure gradient was 120 mm Hg and mean gradient was 30 mm Hg. She was diagnosed as a case of HOCM and started on tablet metoprolol extended release 25 mg BD. On examination, her pulse rate was 100/min and BP was 100/60 mm Hg. She was started on oxytocin infusion for induction of labour and planned for labour analgesia. Epidural labour analgesia was provided with a bolus of 10 ml of 0.0625% Bupivacaine with 2 mcg per ml fentanyl administered in divided doses to achieve a level sensory level of T9 to L1. Maintenance dose of bupivacaine and fentanyl of same concentration at 8 ml/hour was continued. Continuous maternal and foetal monitoring was done. The second patient was a 32-year-old G3P2L0 presented at 39 weeks gestation with labour pain. She was a known case of HOCM for a period of 7 years. She had 3rd degree atrioventricular block for which she was treated with pacemaker (DDDR mode). She was started on tablet Atenolol as a measure to reduce left ventricular outflow tract (LVOT) obstruction by achieving optimal inotropy through reducing the force of contraction, along with tablet Aspirin and Hydrochlorothiazide. With this treatment, she was NYHA class 1 during her current pregnancy and at the time of labour. Her echocardiographic findings showed septal thickness of 1.6 cm, posterior wall thickness of 8 cm with LVEF of 48%. On examination, she had bilateral pitting paedal oedema. Her HR was 86/min; BP was 110/70 mm Hg in right upper limb in supine position. Epidural analgesia was provided with a 10 ml bolus of 0.0625% bupivacaine and 2 mcg per ml of fentanyl in divided doses to achieve a level of T10. This was followed by maintenance infusion of 0.0625% bupivacaine and fentanyl of same concentration at 6 to 8 ml/hour. Management of HOCM stresses on maintaining optimal preload as these patients are preload sensitive, and interventions to reduce the level of LVOT obstruction. Managing a parturient with HOCM during labour requires complete understanding of its pathophysiology and various phenotypic expressions. [Figure 1] summarises the pathophysiological sequence associated with HOCM and the potential target areas for the treatment. During labour and delivery, the LVOT pressure gradient increases as the labour pain progresses. Effective labour analgesia by epidural route offers significant advantage by reducing the pain mediated increase in LVOT obstruction and heart rate. At the same time afterload reduction secondary to labour epidural should be avoided as it increases the LVOT obstruction. General approach to a pregnant patient with HOCM includes risk assessment, stratification, plan for labour analgesia and delivery. In addition, all these patients should undergo echocardiography to assess for the LVOT pressure gradient at rest, presence of systolic anterior motion of the mitral valve and chamber gradients. LVOT obstruction with pressure gradient >30 mm Hg generally increases the risk during pregnancy especially at the time of labour. A dose of 0.0625% bupivacaine with 20 micrograms fentanyl was chosen to initiate labour epidural in our case. This low dose of bupivacaine supplemented with fentanyl ensures lesser chance of developing sudden onset hypotension. Understanding the pathophysiology of HOCM in pregnancy and the effect of labour analgesia in such cases help in better case selection. Epidural labour analgesia should be used carefully in selected cases after thorough history, examination and echocardiographic findings. Pieper PG, Walker F. Pregnancy in women with hypertrophic cardiomyopathy. Neth Heart J 2013;21:14-8. Pryn A, Bryden F, Reeve W, Young S, Patrick A, McGrady EM. 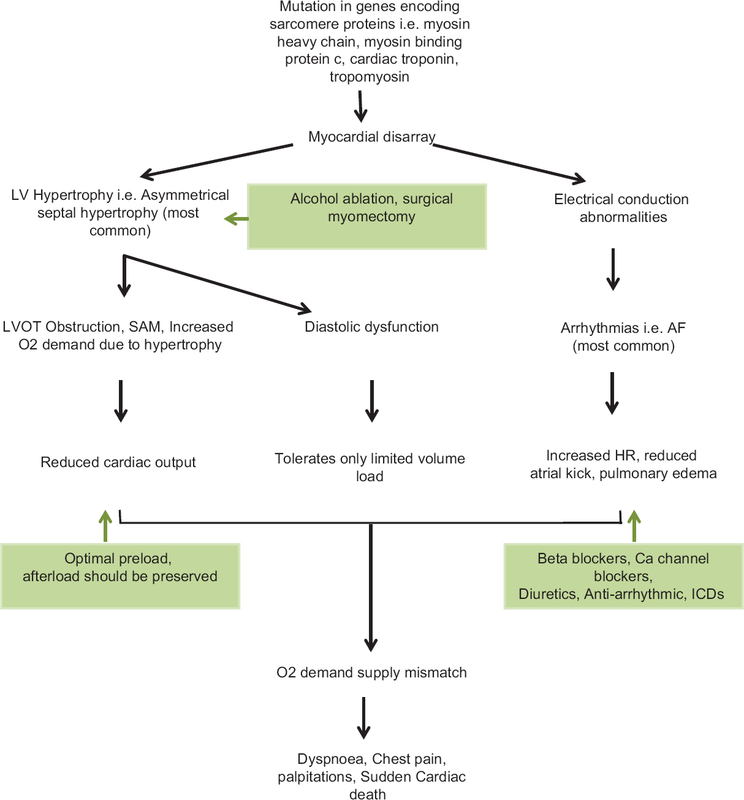 Cardiomyopathy in pregnancy and caesarean section: Four case reports. Int J Obstet Anesth 2007;16:68-73. Thaman R, Varnava A, Hamid MS, Firoozi S, Sachdev B, Condon M, et al. Pregnancy related complications in women with hypertrophic cardiomyopathy. Heart 2003;89:752-6. Ashikhmina E, Farber MK, Mizuguchi KA. Parturients with hypertrophic cardiomyopathy: Case series and review of pregnancy outcomes and anesthetic management of labor and delivery. Int J Obstet Anesth 2015;24:344-55. Kanna V, Hakkim A, Kanakasabai M, Govindan S. A clinical study of the effectiveness of continuous epidural labour analgesia for vaginal delivery with 0.0625% bupivacaine with 0.0002% fentanyl. Int J Res Med Sci 2017;3:2553-60.